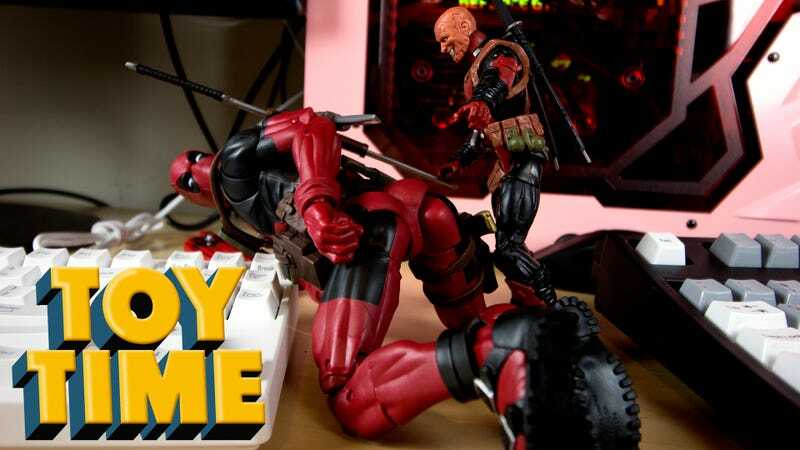 My photoshoot of Hasbro’s Marvel Legends 12-inch Deadpool figure might have gotten away from me, but the point stands—Hasbro has really gotten a handle on 12-inch figures. During the heyday of my Marvel action figure collecting it wasn’t Hasbro making Wolverine, Iron Man and Thor action figures, but rather ToyBiz, progenitors of the Marvel Legends line. Prior to the detailed Legends line, ToyBiz did a line of passable Marvel Universe toys. That line included a series of 10 inch figures that were very, very bad. So when I think of a large Marvel Comics action figure on store shelves, I imagine something horrible like this or Hasbro’s Titan Heroes line. Kids’ stuff. This is not kids’ stuff. Well, depending on your kids. 6-inch Legends Deadpool just kind of showed up. He brought his taco. Hasbro kicked off its 12-inch Marvel Legends line last year, debuting Captain America, Iron Man and Spider-Man at Toy Fair 2016. Instead of the barely-articulated, sparingly-detailed abominations of the past, these figures were premium collector material, packed with extra heads, hands and accessories and featuring nearly as much articulation as the six-inch Legends line. They also carry a premium price tag—each retails for around $50. Now that’s a foot-long Deadpool. Deadpool is the latest entry in the series, with 12-inch Thor and 15-inch Hulk (cheater) waiting in the wings. He comes with six different hands, two futuristic guns, a pair of katana, two knives, technically two extra heads and the world’s first 12-inch scale burrito, as far as we know. Alongside the six-inch scale taco, Hasbro has recreated a large portion of Chipotle’s menu at semi-accurate scale. I say technically two heads, since one of the two included is technically his own character, Zombie Deadpool, AKA Headpool. He comes with his own plastic stand for premium posing potential. He wants a bite. Don’t ask. While Captain America, Spider-Man and Iron Man were released earlier, Deadpool is my first hands-on with a 12-inch Marvel Legends figure, and I’m pretty impressed. It’s nice to see a major toy maker embrace 12-inches as vigorously and passionately as Hasbro has with Deadpool. It’s a far cry from the upscaled plastic monstrosities of the past, utilizing the extra size to provide extra detail. 12-inch Deadpool has so much love to give. My five-year-old saw this shot and asked, “Is he going to kill the raccoon?” I am a great parent. The only sticking point (not counting swords and knives) might be the price. Not that $50 is a lot for a 12-inch figure—I’ve spent a lot more on less. But these are sold at Walmart and such, in toy aisles packed with other ways to spend $50, making going all-in a tougher choice, at least for me. But hell, if you love Deadpool, you love Deadpool, now matter how many inches you get for your money. I felt bad about not photographic the half-mask face, so I left him the taco and burrito.